PREMIUM TIMES has uncovered one of the most fraudulent crude oil deals executed by the Goodluck Jonathan administration, which saw a campaign official and some other suspected cronies of the ex-president smiling to the banks with up to 50 per cent commission from the proceeds of a foreign crude oil lifting contract, turning them into instant billionaires. In the middle of the shady deal is a Nigerian oil and gas company, Sarb Energy, which acted as a dodgy middleman in a non-transparent government-to-government crude oil sale between the Nigerian and the Zambian governments. Sarb Energy, incorporated on September 19, 2008, was specifically established for the controversial deal. This newspaper has established that Sarb Energy has link with at least one political associate of former President Jonathan, whose five-year reign as leader of Africa’s largest oil producer was characterized by allegations of massive corruption, especially in the oil and gas sector. The company’s directors at inception, according to records at the Corporate Affairs Commission, were Nimi Barigha-Amange, a former Peoples Democratic Party’s senator from Bayelsa (2007-2011), who also served as director of planning, research and strategy for Mr. Jonathan’s re-election campaign in 2014; Sylva Ogbogu, a retired Brigadier General; Akpan Ekpene, the managing director of the company, who executed the deal; and Ogba Properties and Investment Company Limited, a company whose real ownership remained unclear. For months, PREMIUM TIMES was unable to obtain its records at the CAC. 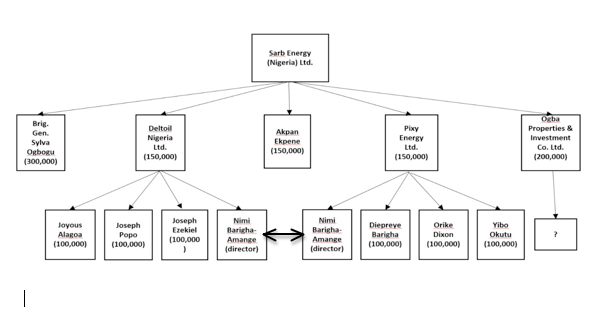 Mr. Barigha-Amange was a director in Deltoil Nigeria and Pixy Energy, two other companies with stakes in Sarb Energy. In a testimony he gave at a Zambian court, Mr. Ekpene said he sold the idea of the government-to-government crude oil deal to the Zambian government in 2008, which then gave his company, Sarb, a power of attorney to execute the contract on its behalf. Under the deal signed with the Nigerian National Petroleum Corporation, the Zambian government was to lift eight million barrels of crude oil worth N155.4 billion ($969.6million). After the deal was sealed on April 20, 2011, Sarb made an initial deposit of $2.5million to the NNPC in the name of the Zambian government. Rather than Sarb importing the crude for use of the Zambian government at home, it was agreed that the company would sell the commodity to other traders, split profit 50-50 with the government and then remit the Zambian government’s share to official administration accounts. But that didn’t happen. What indeed happened was that the Nigerians sold the crude and failed to make payments into Zambian government accounts. Instead, according to Mr. Ekpene, parts of the proceeds were diverted into an account held by Iexoria, a Singapore-based company allegedly controlled by Henry Banda, the Zambian president’s son. No evidence has emerged till date indicating that Zambia received any revenue from the deal. The deal sparked controversy in Zambia, with former President Rupiah Banda charged with multiple violations of that country’s anti-corruption laws. In his testimony during the trial, Mr. Ekpene claimed the proceeds of the deal were passed directly to Mr. Banda and his family. The Sarb managing director told the court that his company made two wire transfers worth $550,000 from its Access Bank account in Nigeria to a Barclays Bank account in Singapore owned by Iexoria. Henry Banda, the Zambian president’s son, controlled Iexoria. Both transfers were made before that country’s September 2011 general elections, when Mr. Banda was still president. A fake consultancy contract was then drawn up between Sarb and Iexoria to support the payments, stating that Iexoria was supposed to carry out a feasibility study for a power plant. Mr. Ekpene admitted in court the contract was a ruse as no such feasibility study was done. He said that approach was adopted to deceive Access Bank into authorizing the transfers. He claimed that he also gave Mr. Banda $500,000 through his son Henry, to boost his election campaign. He said that was after Mr. Banda requested $1 million advance payment from the government-to-government oil deal. Mr. Ekpene also told the court that he helped Banda with campaign materials, which he transported from Nigeria to Zambia, during a trip in which he admitted concealing $260, 000 cash in his luggage. He said he handed over the cash to Banda at the Government House for his use in the 2008 campaigns. He said he made the donation to President Banda because the intermediary in the crude lifting deal, Major Richard Kachingwe, allegedly insisted that they needed to support him to win reelection. Mr. Ekpene may have, however, lied under oath in court during the Banda trial when he said only 5.7 million barrels of crude were shipped out of Nigeria in the deal, with the last cargo loading in December 2012. PREMIUM TIMES found, from NNPC and Finance Ministry records, that 11 cargoes, carrying more than eight million barrels, were lifted in respect of the deal. Insiders say Sarb Energy continued to lift from the NNPC even when the Zambian authorities believed the deal had ended. The Magistrate’s Court in Lusaka, the Zambian capital, however acquitted Mr. Banda in June 2015, saying the prosecution failed to prove its case that the former leader violated Section 99(1) of the Zambian Penal Code. Even though Sarb and its official, Mr. Ekpene, made startling confessions in court in Zambia, including admitting laundering funds out of the country, it does not appear investigation is making progress in Nigeria. Mr. Ekpene claimed in court that Nigeria’s Economic and Financial Crimes Commission looked into the contract in May 2013. But no enforcement action has so far been taken. The spokesperson for the EFCC, Wilson Uwujaren, said he was not aware that any such investigation was ongoing. He promised to crosscheck with the agency’s investigators and then revert to PREMIUM TIMES. The spokesperson for the NNPC, Ohi Alegbe, could not be reached Monday. When contacted by PREMIUM TIMES, Mr. Barigha-Amange, the PDP politician, directed all enquiries on the matter to Mr. Ekpene, the managing director of the company. Mr. Ekpene however declined to comment. He did not answer or return calls. He also did not respond to an email sent to him more than a month ago. Below is a record of the crude oil liftings in the deal, as shown by market intelligence data.